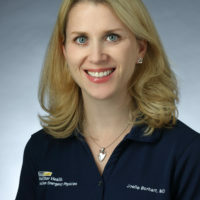 Dr. Joelle Borhart received her medical degree from University of Iowa. She then completed her emergency medicine residency training at Georgetown/Washington Hospital Center in Washington, DC, where she worked as an Assistant Program Director, and is now Associate Program Director. She is a former AAEM Open Mic winner, has been featured on EM:RAP, and has been named Speaker of the Year three times by the Georgetown residents.